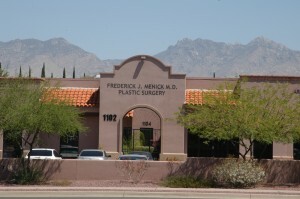 Many of our patients are not local to Tucson, and, in fact, many live outside the United States. Initial patient contact may occur by phone, letter or email. Although we cannot diagnose or treat a medical condition or formulate a final surgical plan without seeing the patient in person, we can provide information to help understand the medical problem and the options for surgical correction. If you wish to submit information to Dr. Menick for evaluation, consider: old photographs, current photographs, a detailed medical history, and operative reports. Dr. Menick will outline the type and number of procedures, their timing and staging, convalescence and recovery, need for hospitalization, anesthesia and surgery. Many patients find this very helpful prior to coming to Tucson for in-patient consultation. Sharing information via email is a convenient way to communicate with Dr. Menick prior to an in-person consultation. However, keep in mind that the privacy of information sent via the Internet cannot be guaranteed. Don’t send personal or medical information or photos unless you accept that risk. It is not possible to diagnose or treat a medical problem without an in-person evaluation. Dr. Menick can provide general information via email, which may be very helpful to you in understanding the problem and possible treatment options. However, any final decision by you or Dr. Menick can only be determined after a complete in-person consultation. Tucson, Arizona is located in the borderland between the U.S. and Mexico and lies within the Sonoran Desert, known for clear skies, fresh air, stunning sunsets, and the majestic Saguaro cactus. Tucson is a modern metropolis with a population of over one million, yet co-exists happily with its Native American, Mexican, and Pioneer heritage. Cradled by five mountain ranges, the Tucson area is diversely composed of flowing deserts, rolling hills, and rugged canyons. The weather is near perfect with over 300 days of sunshine each year; the average high temperature is 82 degrees and the average low is 54 degrees Fahrenheit. Tucson is home to fabulous hotels, guest ranches, golf and health resorts, and luxury spas, including Ritz-Carlton, Loews, JW Marriott, Hilton, Sheraton, Miraval, and Canyon Ranch. Sonesta ES Suites and Marriott hotels are immediately adjacent to Dr. Menick’s office and offer reduced rates to his patients. Hiking, biking, horseback riding, caving, and astronomy are common activities. Tucson has been called the “astronomy capital of the world”, as Kitt Peak and Mt. Graham observatories are close by. Thirty minutes southeast of Tucson is Kartchner Caverns State Park. This stunning “living” cavern system was discovered in 1974 and boasts world-class features, including many unique minerals and formations. The Arizona-Sonora Desert Museum, founded in 1952, combines the attractions of a zoo, museum, and botanical garden. Focusing on the plants and animals of the Sonoran Desert, the Arizona-Sonora Desert Museum is world-renowned and is a pioneer in the creation of naturalistic enclosures for its animals, which include mountain lions, bears, prairie, dogs, javelinas, and gila monsters! The Pima Air and Space Museum is one of the largest air and space museums in the world, housing more than 275 aircraft and spacecraft, including many of the most historically significant and technically advanced craft ever produced in both the U.S. and abroad. The Titan Missile Museum is the only publicly accessible Titan II missile site in the nation. Visitors may tour the launch control center, the underground missile site, and experience a simulated launch. San Xavier del Bac Mission is located nine miles southwest of Tucson and is acclaimed, by many, to be the finest example of mission architecture in the U.S. Built between 1783 and 1797 by the Tohono O’odham tribe under the direction of Spanish Franciscans, it is a graceful blend of Moorish, Byzantine, and late Mexican Renaissance architecture. Since 1955, Tucson has hosted the Gem, Mineral, and Fossil Showcase each February. It is one of the premier gem and mineral shows in the world. Tucson is the home of the University of Arizona, established in 1891, and the leading public research university in the American Southwest. With over 200 graduate degrees and 18 colleges which include law, medicine, architecture, pharmacy, and management, the University has become Tucson’s Center for the arts, science, and thought. The Wall Street Journal has referred to Tucson as a “mini-mecca for the arts” when reviewing opportunities for museums, galleries, concerts, and the performing arts. The University of Arizona Center for Creative Photography was founded in 1975 and retains over 50 archives of great 20th century photographers, including Ansel Adams and Edward Weston. Tucson is about two hours south of Phoenix and one hour north of Mexico. The Grand Canyon is 6 hours away by car, as are San Diego and Las Vegas. Los Angeles is 8 hours by car. 1. Start out going North on TUCSON BLVD. 2. Turn RIGHT onto E VALENCIA RD. 4. Bear RIGHT (North) onto (S) GOLF LINKS RD. 5. Turn LEFT (North) onto WILMOT RD. 6. Turn RIGHT (East) onto SPEEDWAY BLVD.